Smoke Rise Country Club boasts eight lighted tennis courts. Four state of the art har tru clay courts with stadium seating. The other four courts are composite hard courts surfaced in the USTA recommended color combination of Blue and Green; two of the four hard courts have the permanent 10 & under lines. All of the courts have their own gate, for convenient entrance and exit. Our busy tennis programs offer professional training programs for men, women and children. Whether you are a seasoned pro or just learning tennis, Smoke Rise’ tennis professionals can help you score more Aces on the court! Smoke Rise offers individual, semi-private, and group lessons for Smoke Rise members of all ages and skill levels. To schedule a lesson, please contact our tennis professionals. Click here to view tennis courts. 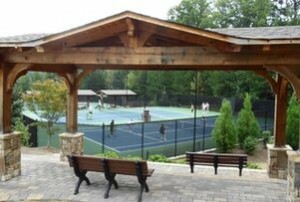 Click here to reserve your tennis court. Suzy was born and raised in Columbus, Ohio. She played collegiate tennis at NCAA Division I George Mason University while completing her Bachelor’s degree in Information Systems and Operations Management. Suzy began her teaching career at the Standard Club, Duluth, GA as an assistant tennis professional. She then served as a staff teaching professional at both Druid Hills Golf Club and Ansley Golf club. She was promoted to Ansley’s Head Tennis Professional, and she managed 3 tennis professionals, 2 shop assistants and a full-time court maintenance person. During Suzy’s tenure the adult Ansley program grew to 18 adult ALTA teams. In the 2013 fall season, 9 of her 18 adult teams made the playoffs. Suzy is a USPTA elite professional. She has been a member of the USPTA and GPTA for 10 years and served in various volunteer capacities. In 2013 & 2014, she served the teaching professionals in Georgia as the treasurer of the Georgia Professional Tennis Association and currently holds a position on the USPTA Georgia Board of Directors. She is also a certified personal trainer with International Sports & Sciences Association. Suzy prides herself in her ability to create a tennis community that is family oriented and welcoming to all levels. Jim has a wealth of experience in the tennis industry spanning over 15 years in leadership positions. Jim has worked at some of the top high performance tennis academies in Florida, directed county wide programs for Parks Departments, has been a Director of Tennis at Country Clubs and Resorts, and has been a Junior Academy Director both in the United States and abroad. Jim has taught nationally ranked juniors including state champions, Division I college players, and ATP/WTA players. Jim also has extensive experience doing both video technical analysis and statistical match analysis for juniors, adults, and professionals. He is a USPTA certified P1 elite instructor, USTA level II sport psychology and motor learning certified, and is Tennis Smith Trained. He is also an article contributor to USPTA ADDvantage, Florida Tennis and Serve it Up magazines. Before coming to the United States, Jim played competitively in Europe and college tennis for the University College of Wales. Jason is a native of Athens, Georgia and brings over 8 years of experience as a teaching professional. He played college tennis with John Isner. He started playing tennis at a very young age and was ranked #1 in the state as a junior player, top in the south and a top 25 nationally ranked junior. He was a State High School Champion as well as a sectional and nationally ranked junior player. He went on to play college tennis on scholarship at The University of North Carolina at Greensboro before transferring and playing at The University of Georgia, graduating with a Bachelor’s degree in 2006. Jason worked two years at the Tennis Academy of the South in Atlanta then moved to Florida where he worked at Harold Solomon Tennis Institute and Saviano High Performance Tennis Academy for three years. He has worked and practiced with some top WTA professionals and collegiate players such as Elena Dementieva and Sloane Stephen. Jason returned to Georgia and has been working with juniors, as well as adults at the Tennis Academy of the South as well as a tennis professional at Atlanta Athletic Club. He is a USPTA certified pro. Jason brings a wealth of knowledge as a player and instructor at all playing levels. Smoke Rise Country Club’s tennis ball machine is available for our members to use both on their own and through our lessons, clinics, and camps. To reserve the ball machine, please call the club at 770.908.2582.